In this column, Dr. Bradnee Chambers, Executive Secretary of the United Nations Environment Programme's Convention on the Conservation of Migratory Species of Wild Animals, describes the effects that climate change-related extreme weather events will have on the travels plans of both people and animals. SAN JOSÉ, Apr 9 2014 (IPS) - There are few experiences more frustrating than a delay in travel plans caused by bad weather. According to the Intergovernmental Panel on Climate Change (IPCC), this may be something we will have to get used to in the future. In March 2014, the IPCC released the 5th assessment of the impacts, adaptation strategies, and vulnerabilities related to global climate change. The report makes it clear that travelling in the future will become more of an ordeal. Extreme weather events related to climate change, such as heat waves, storms and coastal flooding, are predicted to increase in frequency with only a 1°C increase in average global temperature – and current trends indicate even higher rises in average temperature. Besides the more serious effects, this is a recipe for more travel delays, larger numbers of travellers stranded and a greater overall risk associated with travelling. And the news gets worse if your destination involves beaches or coral reefs. As more ice melts from the polar regions, the world’s oceans creep higher. Coastal regions and low-lying areas could suffer from submergence, flooding, erosion of coastlines and beaches, and saltwater pollution of the drinking water supply. At sea, normally colourful corals are experiencing “bleaching” or turning white as a stress response to changes in the water itself. Carbon dioxide (CO2), a greenhouse gas, is dissolving into the world’s oceans, making them more acidic. These changes are problematic for human communities. But people aren’t the only global travellers affected by climate change. Nobody knows this better than the Convention on Migratory Species (CMS), which is dedicated, as its name indicates, to conserving international migratory species. Migratory animals face many of the same challenges that humans do: having to choose when to travel, what route to take, where to eat and rest, and how long to stay before returning home. Unfortunately, these choices that are seemingly so trivial for humans are life-or-death decisions for migratory animals. Migratory animals are potent symbols of our shared natural heritage, with their migrations often spanning continents. With warmer, wetter winters, migratory birds in Europe will be forced to migrate to breeding grounds earlier or face population declines, shrinking ranges, and the worst possible outcome: extinction. The Monarch Butterfly undertakes an impressive migration spanning multiple generations, traversing vast distances across the North American continent. Climate change is transforming the current wintering habitats of this butterfly in Central America, making it more prone to wet freezes resulting in catastrophic mortality events. Severe droughts, meanwhile, threaten one of the greatest migrations in the world, involving hundreds of thousands of wildebeest and other animals travelling across the Serengeti Plains of Africa. In the world’s oceans, the planet’s largest fish species, the Whale Shark, is also threatened by climate change. Changes in global ocean temperatures and chemistry may cause declines in the numbers of this species in the future. 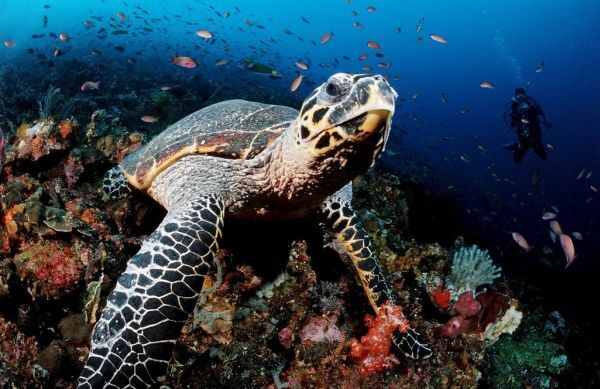 In marine turtles gender is determined by sand temperature on the nesting beaches, with cool beaches producing more males and warm beaches more females. Increasing sand temperatures mean that more females than males are born, thus affecting the optimal gender ratios. In light of these concerns, the Convention on Migratory Species is holding a workshop with national representatives and scientists in Limón, Costa Rica Apr. 9-11, 2014. The goal of the meeting is to develop a Programme of Work on climate change and migratory species, addressing the need for monitoring, conservation, and adaptation strategies that accommodate the unique needs of migratory animals in the face of climate change. The results of the workshop will be presented to the eleventh meeting of the Conference of the Parties to CMS which will take place in Quito, Ecuador, Nov. 4-9. The prospect of having to sit even longer in airport terminals is doubtless frustrating for poor weary human travellers, but it pales into insignificance when compared to the ever worsening odds that migratory species are facing in their struggle for survival. Climate change is a complex and daunting problem. The plans to reduce our impact on climate are important and so are the plans to mitigate the damage we’ve already done. Hopefully, through cooperation and active effort, we can conserve the beauty of travel and our travelling animals for future generations to come.